Koran Angelfish or Pomacanthus semicirculatus belong to the family Pomacanthidae.This species is endemic to the Indo-Pacific and the Red Sea as far east as Samoa. Their geographical range stretches from Japan down the entire east coast of Africa to Western Australia and New South Wales. These are reef fish occupying depths from 3-100 feet. One of the common traits among large angelfish is the dramatic transitional color change between the juvenile and adult phases of their lives. It is simply amazing watching a juvenile's gradual metamorphosis into its adult color palette. Korans undergo three distinctive stages on the sojourn to adulthood. The Greek word semicirculatus refers to the initial phase of their life. Baby Korans have black bodies with blue and white striping that expands concentrically forward from the base of their tails. This patterning very much resembles 1/2 of the ripples on a still pond when a pebble is suddenly dropped into it. A baby Koran could easily be mistaken for a juvenile emperor angelfish. Closer examination reveals that Koran's have wider stripes and fewer of them. When these fish reach about 3 inches in length the semicircular markings slowly straighten into sweeping lines. At roughly five inches in length the fish begins to exhibit patterning between the blue lines on the tail fin that resembles Arabic script, hence the name Koran angelfish. They exhibit a combination of juvenile and adult coloration. This marks the conclusion of stage two. At approximately two years of age and between 6-7 inches in length, this species morphs into its adult color palette. Adults are typically a yellowish green in color with varying amounts of blue or browns spotting on their bodies and caudal fin. Their heads may be blue or their primary body coloring. Gills and fins are outlined in blue. This species is marketed by the aquarium industry under the following names; Koran Angel, Blue Koran Angel, Half-circle Angel, Half-circled Angel and Semicircle Angel. These fish will grow to a maximum adult length of 16 inches. Because of their size, they will require a large aquarium. A minimum tank size of 135 gallons is recommended. A well-populated multi-species tank should be considerably larger. This fish has a semi-aggressive temperament. It may bully smaller fish. It will, for the most part, ignore other larger species. It will, however, display major territorial behavior toward conspecifics and other angels. It is advisable to only keep a single large angle fish of any species in an aquarium. Many species of large angles carry an expert care level. Korans are rated moderate. A healthy Koran may live 15-20 years. Korans are omnivorous. In nature, their diet consists of a mixture of corals, algae, sponges, worms, mollusks, and crustaceans. Their dietary habits make them unsuitable for a marine reef aquarium. They will, however, require a large enough of an assortment of live rock for a fish of their proportions. Having a food source they are already accustomed to will aid in the acclimation process. You can begin training them to recognize aquarium fare as an acceptable food source by mixing increasing amounts with live food offerings such as brine shrimp. This is the best technique for weaning them off live food. 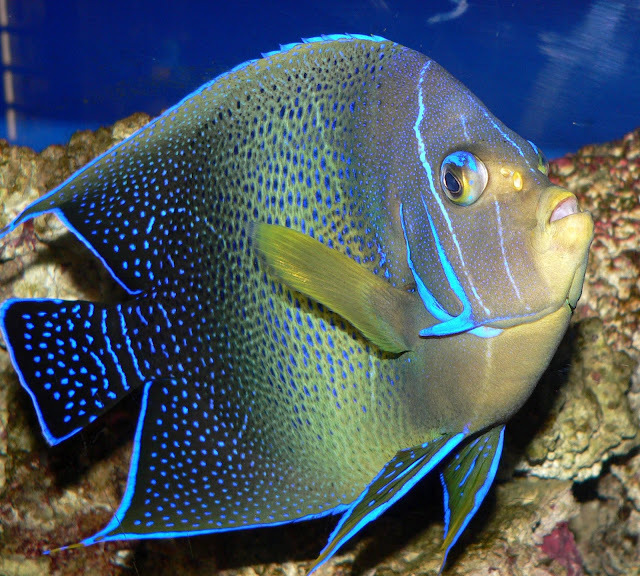 Make sure to choose a high-quality food product formulated for marine angelfish. Once they are successfully weaned, their diet can be supplemented with the following; chopped fresh crustaceans and mollusks for protein, table vegetables such as chopped spinach, zucchini and yellow squash for plant matter, frozen or dried algae such as algae sheets to ensure a well-balanced diet.